Welcome to the fifth issue of the Columbia College Class of 1963 eNewsletter. It's starting to be a habit, and each month I hear from someone who has not been heard from in quite awhile. I figure if we keep this up, the word might spread and I will hear from my long missing freshman year roommate, Patrick Cary-Barnard (if anyone is in touch with him, please let me know). If there is anybody from our class, who you have lost touch with, and would like to find, let me know. If Columbia doesn't know where they are, I'll start a "lost" list here, and those of you with the missing information can pass it back through me. As I mentioned last month, if any of you would like to send a longer format article for inclusion here, send me an email (pauln@helpauthors.com). I would like to see if we could expand the scope of this eNewsletter to give the class a fuller forum for communication. 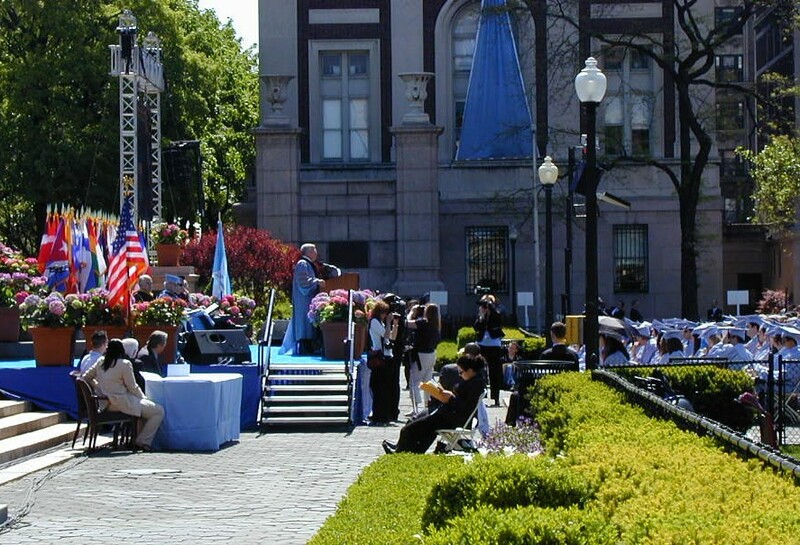 I also have talked to Columbia about setting up a Class of 1963 site within their eCommunity structure, and still welcome your ideas on what could/should be included there (nobody suggested anything in May). The next issue of Columbia College Today (CTT) that I can get new articles in will be the September one (deadline first week of July). Please send me more news before then, If you'd like it published while it's still fresh. It's always great to learn what you're up to. Hope to hear from you, so we can let everyone know what you've been up to. Every Second Thursday, 12:30 p.m. to 2:00 p.m. Please join your classmates for an informal lunch at the Columbia Club every second Thursday of the month. It is our hope that these gatherings will renew old friendships and foster improved relationship with our class and the College. The next lunch will be on June 9, 2005 (NOTE: Revised date) . The sixth Second Saturday Class of 1963 lunch was again well attended and included a couple of welcome fresh faces. Joining us for the first time were Daniel Perl and Ben Tua. Here is the happy group. I hadn't seen Daniel Perl in a while (who can forget his famous talk on Alzheimer's disease at our physician panel at the 35th Reunion (or was it the 30th?). He is still on the staff at Mount Sinai Hospital here in NYC, and his expertise in neuropathology has had him in the media lately (I caught him on TV commenting on the Schiavo case, and again, adding his critique of a controversial theory for a rare brain disease described in The New Yorker article, "The Tangle" in the April 11, 2005 issue. I hadn't seen Ben Tua since our undergraduate days. He has retired from the State Department after 27 years of service. His posting included 13 different countries. A fascinating life, and I hope he will share some notes here in the future. I have included some very bad candids of the last lunch, which you should be able to access through this link. We always a great group at the lunch, but still over 550 of you haven't shown up. So, please join us at the next lunch on Thursday, June 9 (NOTE: Revised date). Please let me know if you will attend so that we can reserve a big enough table; RSVP to Paul Neshamkin (pauln@helpauthors.com). For information and inquiries call Paul Neshamkin at 201-714-4881 or email at pauln@helpauthors.com. 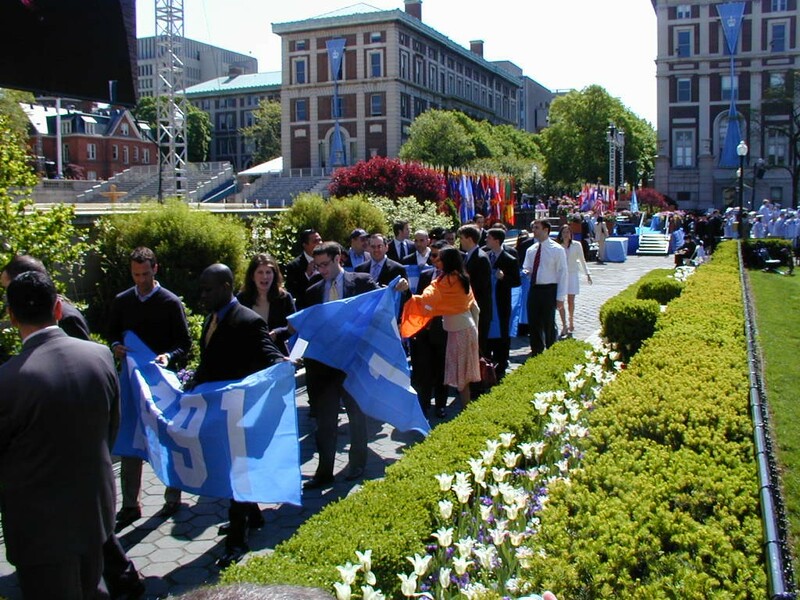 I attended Class Day at Columbia on May 17, and took part in the Parade of Classes, a two-year old "tradition" that has representatives from the last 50 years of alumni carrying their class flag. Last year Don Margolis and I carried the 1963 flag, this year I was alone (the other no-show flag carrier will remain anonymous). The weather and campus were beautiful, and the Class Day Keynote Speaker was our classmate, Bob Kraft, who gave the Class of 2005 some good advice on what to look for in life ( a couple of Super Bowl teams turns out not to be as important as the pleasure from a happy family). I wasn't able to get close enough to get a good picture of Bob, and have not found one on the Columbia web site, but these might give you the general idea. Some of the younger classes parade. Here is a selection of notes and news that you have sent me in the last month. Steve Bauer writes, "My wife,Linda, and I have 5 children and 9 grandchildren between us. As I indicated to you previously, my 3 are all Columbia College grads. Diane ('88) went on to Hopkins Medical School and is a practicing dermatologist in Baltimore with 4 kids, Lauren ('90) is a Fordham Law grad with 3 little ones including twins. David ('97)is a derivative trader on Wall Street. I am still working as a senior tax partner with RSM McGladrey in Stamford . We live in Pound Ridge, NY and Naples, Florida, and get down south as often as possible. Looking forward to meeting you guys at the next luncheon. " Steve, you didn't make the May lunch, I hope to see you on June 16. 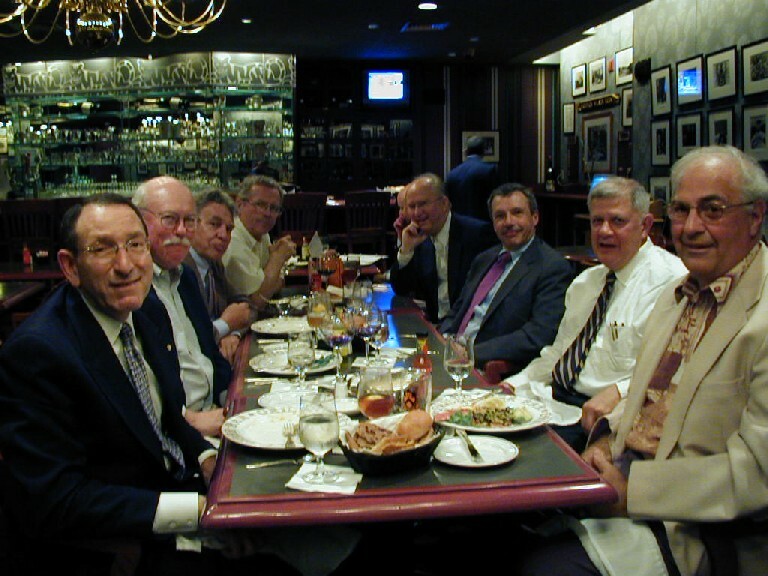 Gary S. Rachelefsky says that he "saw classmates Sy Moskowitz and Gary Toback for dinner in Chicago recently. Nice to catchup. I’m still practicing Allergy/Immunology full time in Los Angeles while actively being a clinician-scientist. The family continues to thrive and grow – Holly (36) has 3 children - Emma (7 ½), James (5), Caroline (4). Cara (32) CC ’94 (and David Cuse CC 94) have a recent addition (2 ½ week old Adam) to complement Colin (22 months). Lindsay (26) CC 2001 is head of development for the ACLU of Southern California. Gail and I are well and looking forward to our 39th wedding anniversary." Steve Barcan and his wife, Bettye (Barnard ’65) welcomed their third grandchild, Max Jeramiah Barcan, born April 22, 2005. Zev bar-Lev writes, "If you include my news in class notes, you can add a parenthetical (né Rob Lefkowitz) to my name, to help recognition. "I noticed that Ira Epstein is looking for a class ring. I’d be happy to part with mine: It has the wrong initials anyway. (In case you missed my announcement in class notes a few decades ago, I was once Rob Lefkowitz CC 63 — until we lived in Israel.) I think I can find it: I think I saw it recently, poking through some box or other of old doodads." Well, Ira, here's your big chance. Zev continues, "I thought I might also share my “news”: I’m finishing up my 26th year as professor of linguistics at San Diego State University. My wife Shoshana (formerly Jane Wirth, Barnard 63) has been an account executive (i.e. stock-broker) and VP for 22 years, for the last many years at AG Edwards. We’ll be going to Israel this summer for me to give a lecture in Jerusalem, and for us to visit our son — and, God willing, greet our second grandson. Our first grandson lives with his mother and father — in San Diego; our other daughter also lives here. My main research specialty for 20 years has been my “heretical” method of foreign language teaching (see my website languagebazaar.com); my Hebrew series is used at 3 universities, and hopefully soon at additional universities and schools. I lecture around town on topics from Judaism and kabbalah to Middle-Eastern and American politics." I visited Zev's web site and found his language instruction methods fascinating, and the sample courses easy. I recommend you take a look. Yoshiharu Fujisawa wrote, “You may have heard already, but I regret to inform you that David Cohen, my freshman year room-mate at Hartley, passed away several months ago from leukemia. As I was an ignorant foreigner being 7000 miles away from home, David, a local New Yorker, was a big help for me and I certain miss him a lot. Yoshiharu, I'm sadden to hear of David's death, and have passed the news on to Columbia. If any of you knew David, I hope you will share your memories with us. "Here's a newsnote for you: I'm one of the convenors of the PS 99 ~ Brooklyn, Class of 1955 Reunion, taking place at our alma mater on June 24, fifty years to the day when we graduated from the 8th grade. Yours truly was 8th Grade President, and I'm leading a fundraising drive among my classmates to support arts and music programs at our beloved elementary school. Cinematic note: Woody Allen graduated 6 years ahead of us and named the psychiatrist portrayed by Mia Farrow in "Zelig" after his and our PS 99 principal, Dr. Eudora Fletcher." I hope to meet up with Michael when he gets to New York in a few weeks. I told him I was disappointed that my old alma mater, PS 6 (Manhattan) didn't have a 50th (or maybe they did and didn't invite me). There must have been about 10 Class of '63s from PS 6 (love to hear from you all). Doug Anderson dropped me a note to say hello, and I asked him if he still collects art glass, he responded, "Yes, we're still involved with the contemporary glass world but Dale, the one with the collector itch, has focused on very edgy photography. Occasionally we will buy a piece of sculpture made of glass if it's fabulous but we've been there and done that for 25 years and eventually you've done it all too many times. That said, we're still trustees of Pilchuck Glass School outside of Seattle (after more than 15 years). It's kind of a cross between a hippy commune and a school........started by Dale Chihuly and a few hardy souls 33 years ago and we're always being thought of as "glass collectors" which is fun when I'm asked to give a lecture or sit on a panel." Great to hear from you all. Share your news and views with your classmates. Contact your Class Correspondent, and let him know what you would like posted here or in Columbia College Today (CCT). I have absolutely nothing to update you on on the planned mini-reunion. Bottom line is we need to hear from you to see if there is any interest out there. If you come, we will build it. Plans to center mini-reunion events around the Homecoming Game on October 15 proceed. Start with lunch with your classmates on Friday, the 14th, and then some socializing that evening. On Saturday, we will get together at the Homecoming tent in the morning at Baker Field, and then watch Columbia beat Penn at the Homecoming game that afternoon. We then will then probably have another gathering on Saturday afternoon/evening to be determined. For those of you who missed the last real reunion (and most of you did) this is a great opportunity to meet old friends and acquaintances, and have some fun. Watch this space for more news as we firm this up, but save the dates, October 14-15, 2005. And, let me know if you would like to take part in any of this. I will post a list of prospective attendees in the July eNewsletter, and in the September CCT (remember my deadline is the first week of July).